How many times have you sent a test home for parents and families to sign without getting it back? 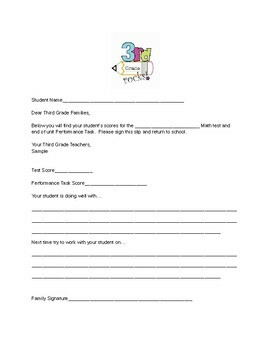 This form can be used to send home math test scores and results to parents. By using this form, you will be able to hold on to the original tests and quizzes, while keeping your students' families informed of student progress. I have included lines for you to write what the student is doing well with in math and what the student needs to continue to work on. Families love these sheets because they act as a mini report card. You may edit the file to meet your grade and testing needs. Enjoy!